A MUST FOR NORTH AFRICAN COOKING. I like to use Meyer Lemons for their milder sweeter taste and less acidic flavor. COOKS NOTE* You can use ½ water and ½ lemon juice,  but don't skimp here! lemon slightly and pack inside with salt. 3. 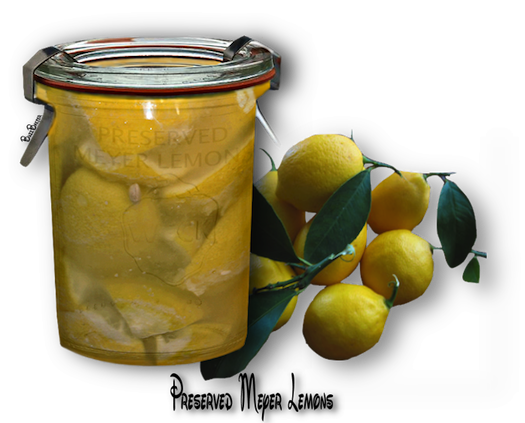 Pack into jar and repeat with remaining lemons. 4. Add enough lemon juice to cover to the top. 5. Add pickling salt and close jar tightly. 6. Set aside to pickle for at least 3 weeks. 7. Every few days, turn jar over to redistribute juices and let stand on its head for a few days, then invert again. 1. Sterilize jars as you would with any proper canning proceedurre.